Hey, Listen, I can play a harmonica harmonically! In June 2005, NBC and CNN ran an intriguing news story about an orangutan named Gypsy who is forty nine years old (over eighty years old in human years) and lives at the Tama Zoo on the outskirts of Tokyo. Feeling deeply touched by the report, a group of initiates from the Tokyo Center went to see Gypsy and offer the following glimpse of what they discovered during their visit. Gypsy is one of the Zoo’s five orangutans, all of whom have distinct personalities that offer great insights into the divine nature of these lovable, tenderhearted friends from the forest, who never hunt and kill when in groups as gorillas and chimpanzees do. Gypsy works diligently at gardening. 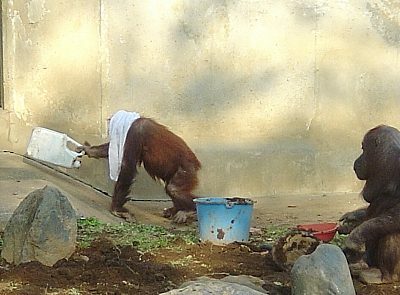 Over the past year, when the Zoo’s head keeper for primates, Hidetoshi Kurotori, introduced manmade items such as household cleaning tools and musical instruments into the apes’ environment to promote “orangutan enrichment activities,” Gypsy began to display some surprising behaviors. Of all the Zoo’s orangutans, Gypsy is by far the most curious and capable pupil, and has demonstrated numerous skills, including the ability to clean her cage with a cloth and broom, dig and place dirt in a bucket with a garden trowel and play the harmonica. 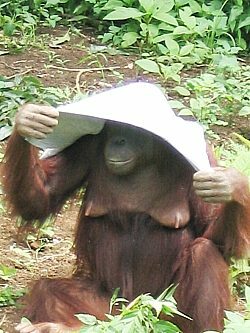 Under the scorching sun, Gypsy wears a shirt on her head as a hat. Gypsy performs these tasks with more skill than her companions. And although two of her ape friends can play the harmonica in a simple fashion, only Gypsy understands how to blow and move the instrument from side to side in her mouth to produce different musical notes. Another of Gypsy’s remarkable traits is her sense of fashion. She loves looking at glamour magazines, focusing mainly on pictures of attractive models in the latest designs. 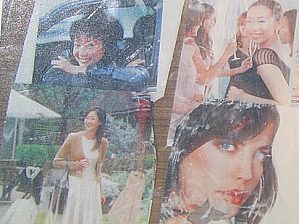 She skillfully tears out her favorite fashion photos and carefully tucks them away in her pillow case, where she stores all her keepsakes. Having the dexterity to tear articles from magazines is an incredible feat considering that orangutans have a maximum grip strength of over 300 kilograms, and need to control this remarkable power to do such intricate manual work. Similarly, orangutans in the wild tear long blades of grass to use as tools for dipping into termite mounds in search of food. So to allow its orangutans to practice this activity, the Zoo has constructed artificial termite mounds and regularly fills them with juice, which the orangutans lick from blades of grass after dipping them into the mounds’ tiny holes. 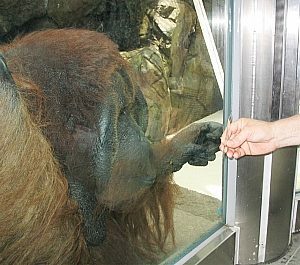 Next, the initiates entered a building with a glass enclosure housing a large male orangutan named Q. Males of the species are much larger than their female counterparts and generally avoid the females except during mating season. Q was two-years-old when he came to the Zoo in 1971 and during his early life was less friendly than the other orangutans, but in the last few years he has become more calm and gentle. When we approached the glass partition that separates him from the viewing area, he came right up to the glass and sat in a half-lotus position with his hands gently folded in his lap. We then sat together quietly and began to commune with each other. Soon a brother placed a picture of Master close to Q, and the ape seemed entranced. He kissed the glass several times and continued to look steadfastly at the photo, having the same reaction when a sister displayed another of Master’s recent pictures. Again Q concentrated on the image and remained very still for an extended period. Male orangutan Q steadfastly gazes at Master’s picture. Next the brother put his hand on the glass, the gentle giant placed his hand in the same area on the other side and the two stayed in contact this way for several minutes. All the while Q seemed to meditate peacefully with his eyes open until some new, noisy visitors entered the enclosure and disturbed his tranquility. The orangutan then got up, walked to the other side of his cage and banged mightily on the bars, sending loud reverberations throughout the complex as we stood in awe of his power. Q’s demeanor changed with the ebb and flow of visitors and their respective behaviors, enjoying peace during some periods and feeling disturbed when the atmosphere became disruptive and noisy. As other visitors entered the area he became agitated if they banged on the glass or startled him, and seemed to crave a quiet place to continue meditating. The creature looked like an Indian sadhu with his long red mane and serene disposition. Regarding Gypsy, it is interesting to note that the amazing progress she has made in her physical skills has only occurred during the past year. Perhaps these gentle vegetarians have indeed been elevated as we enter the Golden Age! ?